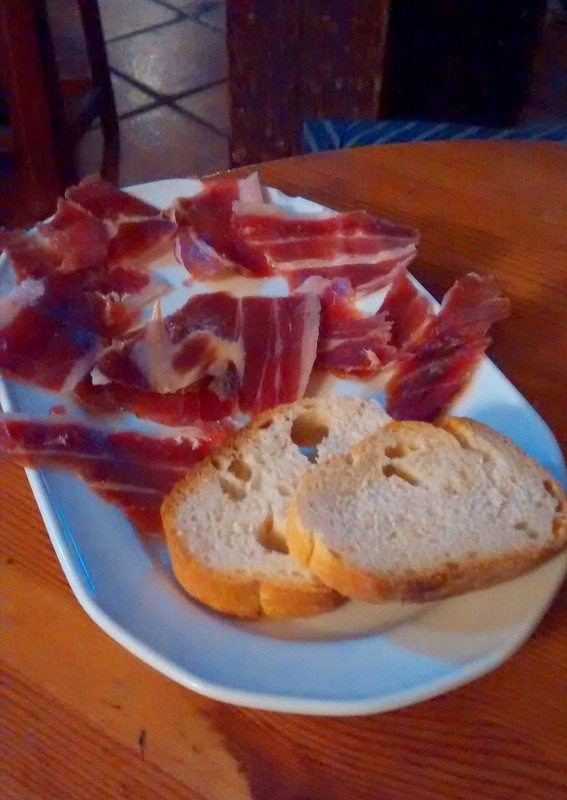 My research of what to do in Madrid was virtually non-existent; no guide books or detailed downloads from friends. Highly unusual for me. One of the few things I had heard of before visiting was the El Rastro Flea Market. The reviews of the market itself weren't great, but it seemed to be a bit of a Madrid institution which the locals flocked to each weekend. We set off from our apartment around midday and drifted towards the market. We followed the crowds through Madrid assuming they'd take us to El Rastro. We ended up over shooting slightly and ended up in the La Latina district and had to get the map out to bring us back on track. However, it wasn't really a problem as it was good to see some more of Madrid and people watch. The market lived up to expectations of being heaving and selling absolute tat. We drifted round some of the backstreets and down the main street of Calle Ribera de Curtidores eventually ending up in the Plaza Campillo del Mundo Neuvo. We decided to sit down for a short break. As we sat down we noticed that everyone was carrying small white plates of food. They looked good, very good. I wasn't hungry but seeing all of the tostadas was peaking my appetite. After a quick rest and a sip of water we decided to follow the tostada trail and see if we could find the source. It wasn't too hard to track down the source, El Capricho Extremeño. The small café was packed and we stood outside a bit nervous about venturing in. I steeled myself and plunged in making it to the counter. I pointed and said 'queso y jamon' and two tostadas were placed in front of me. The lady serving me said something which my rusty Spanish couldn't understand, I replied with a meek 'si' hoping it would be appropriate. She started pouring two plastic cups of wine. Were they for me? I handed over 20 EUR and was given a lot of change. I reasoned the wine could never be for me at these prices so picked up the tostadas and made my way out of the door. It bought no quizzical looks for leaving the wine behind, so I think it was the right thing to do. We headed back to the Plaza to eat our purchase. The goats cheese was good, but the jamon tostada completely knocked it out of the park. 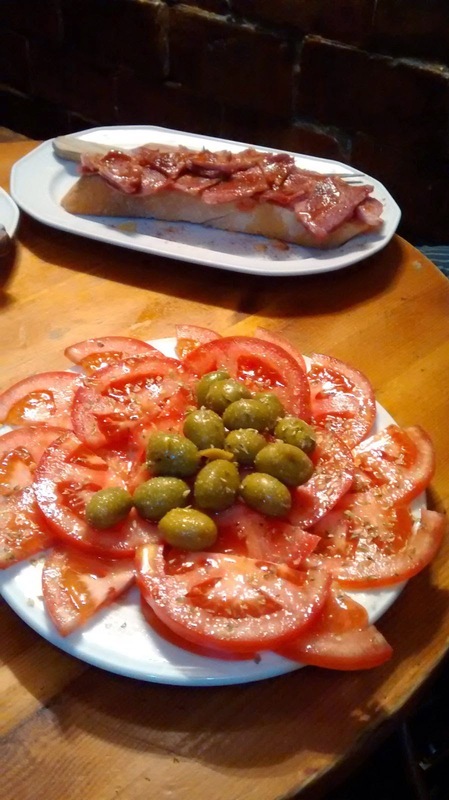 Great bread rubbed with garlic and fresh tomato, topped with ham and then drizzled with olive oil. Comfortably the best open sandwich I've ever had. Once I'd recovered from the awesomeness of the tostada we decided to carry on drifting across Madrid. Without a real plan I decided we should aim for the viaduct marked on our tourist map. I was envisioning an impressive Roman viaduct, but when we got there it was a modern concrete monolith. I'm not quite sure why it was marked as a landmark! From the disappointment, it was on to the outside of the Cathedral and Royal Palace before we headed back to our apartment via one of the main shopping streets and the Puerta Del Sol, the main square of Madrid. 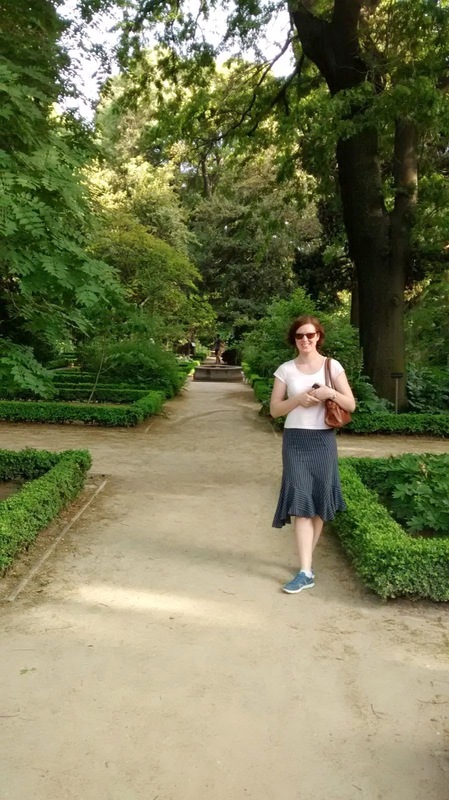 When we'd visited the Retiro park the day before, we noticed that the nearby Museo del Prado was free from 5 - 7pm on Sunday evenings. After a rest in our apartment we headed across to the museum arriving just after 5pm. Trying to take in the museum inside two hours was a little overwhelming. The Prado is set in a magnificent classic building, which is the perfect scale to show off the large classical paintings on display. We zipped round the two main floors trying to take in as much as we could in the time. Classics, particularly the religious art that the museum seemed to specialise in, aren't really my thing but there were a few enjoyable paitings and you couldn't help but be impressed by the building. We left the museum as the doors closed at 7pm. After a short sit on the museum steps we decided to head to the neighbouring Botanic Gardens. Just like the Retiro the day before the park was a real stunner and fantasic value at 3 EUR each. We slowly strolled up and down every avenue of the formally laid out garden taking in the plants and mixing with the locals who were out doing the same things. 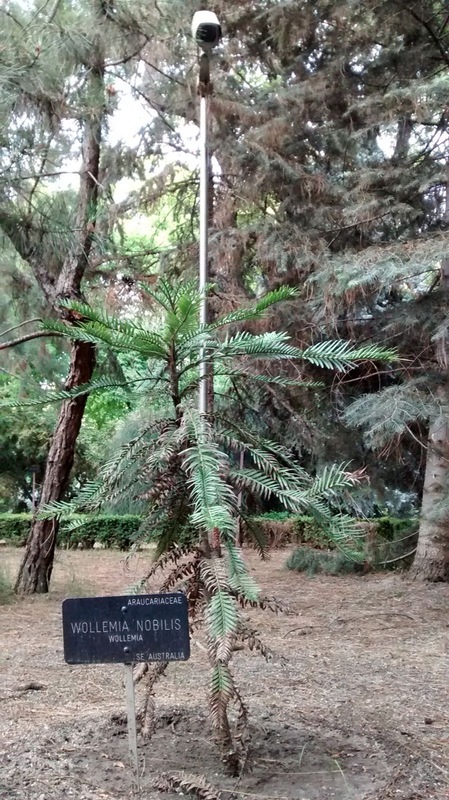 During our ambling I spotted the Wollemia Nobilis complete with its own CCTV camera. Apparently a rare Australian plant it is only one of twenty one in the world. We were kicked out of the park at 9pm as they closed for the night and we were rushing to take it all in at the end. With the time approaching an acceptable point in the evening for Madrillians to eat we decided to head to Matador which had been recommended by our hosts. A small bar it felt almost themed (which generally puts me off), but we pulled up a couple of stalls and ordered some drinks. Three drinks each later and a few snacks from the tapas menu we headed out off the bar 30 EUR lighter. You wouldn't have got the drinks for that price in London, let alone the tapa on top. Not quite ready for bed we decided to check out some of the side streets near our apartment to walk off dinner. As we drifted past El Lacon, where we'd eaten the night before, I heard a familiar Kiwi voice behind us. 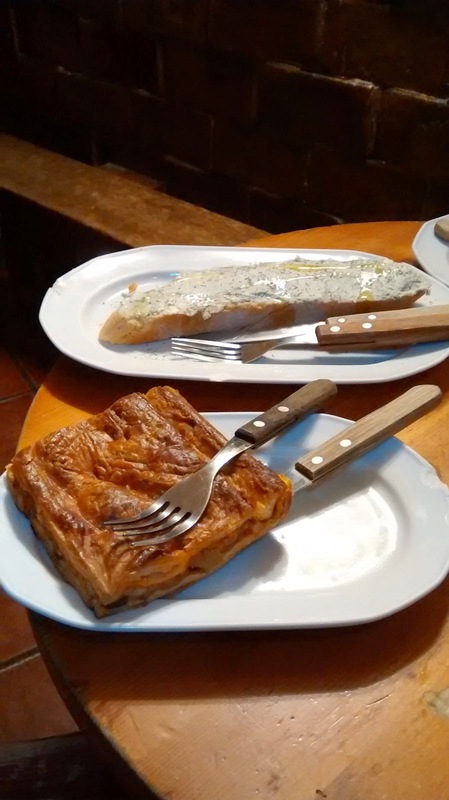 It was James from Madrid Food Tours whose video on El Rastro we had watched that morning and who would be taking us on a food tour the following night.